Home sales in Southern California declined last month for the first time in nearly two years, as buyers appeared to time their purchases to cash in on a state tax credit and supplies of affordable inland properties dwindled, a tracking firm reported Tuesday. San Diego-based MDA DataQuick said home sales in the six-county region dropped about 1 percent last month from April 2009 to about 20,300, breaking what had been a 21-month run of consecutive year-over-year increases. Sales also fell about 1 percent from March. DataQuick spokesman Andrew LePage speculated that sales may have slacked because buyers were waiting until May to close escrow so they could take advantage of a new state tax credit that became effective at the beginning of the month. Sales also were likely tamped down by the decreasing availability of low-cost foreclosures in the region's inland communities, which had been fueling much of the last year's sales growth. Foreclosures comprised about 36 percent of resales last month, down from almost 54 percent a year ago. "It's tough to compete with a year ago, when there were so many more lower-priced foreclosures," LePage said. "They're what really kick-started the market here." 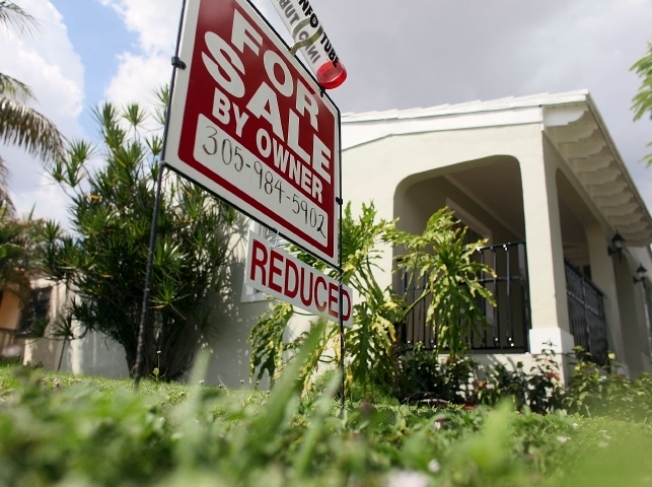 DataQuick also said the median home price in Southern California rose last month to $285,000. That's up about 15 percent from $247,000 in April 2009, when prices reached their lows for the housing downturn. The median was unchanged from March. DataQuick President John Walsh said the conflicting combination of year-over-year price increases and faltering sales suggested a robust recovery was still struggling to take hold. "It's unclear which of today's sales characteristics are part of a new reality and which are still temporary turbulence," he said. "The market's still taking baby steps on a long road to recovery, trying to find its footing." Richard Green, who directs the University of Southern California's Lusk Center for Real Estate, said the sales drop indicated that the market could be hitting a speed bump, possibly because obtaining credit is still difficult for many borrowers. But he said he was encouraged by the price increases, which showed that most buyers over the last year have not lost equity in their homes. "I think it's more good news than bad news, but obviously it's nothing so great that people should be dancing in the streets about it," he said of Tuesday's report.